Evey Jones doesn’t take shortcuts. 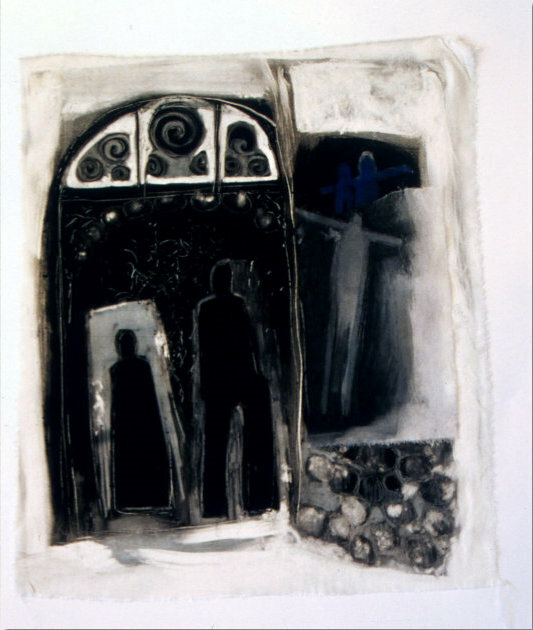 Her monotypes are the last phase of an intuitive yet exacting process. When she travels, Jones might see something out a window that attracts. The artist is drawn to light and color changes in an environment, which she photographs as an aid to her memory. At home, she prints these out and begins playing with the scale and format, using xeroxes as a means of transforming the original information. Moving to a sketchbook, she works out patterns and motifs in pen, which become the basis for a sequence of watercolors of varying sizes. This shift creates a very different relationship of her hand and movements with the page, as the process becomes increasingly tactile — from image to object. Jones then takes on large charcoal studies in which black and white assume a rich presence. Finally Jones works the plate: “my fingers in the ink, mixing it, the texture, the smell of the ink, the ‘feel’ of the press.” Never spending more than two days, she becomes absorbed with the viscosity of the ink, adding and removing in a way that is almost sculptural. Printed on silk, the bold monotypes become one with a material of ancient association and itself a natural metamorphosis. Supervising a high school trip to Italy, Robbins was moved by her experience of the mosaics of Venice. The capacity for mosaic to allow exterior ornamentation and its response to light delighted her sensibilities. The medium can transform the mundane into the extraordinary, while always changing in relation to the surrounding conditions. Citing the similar origin of “muse” and “mosaic,” Robbins values the spontaneity that it affords her process. 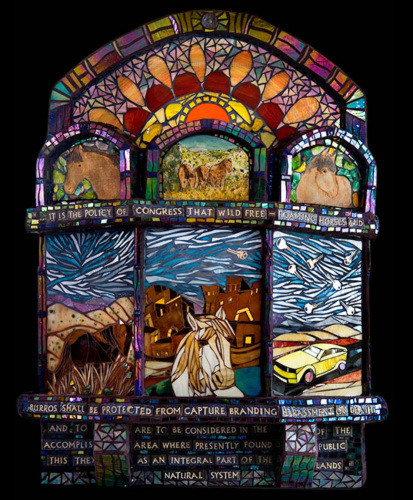 Winning a Millicent Rogers Museum Award in “Originals 2007,” Altar for Wild Horses is an imposing work that situates a white mustang in the spot usually reserved for the divine. Attendants horses are in niches that usually house saints, with one spot reserved for an automobile — destroyer and namesake. Instead of sacred text, Robbins includes words from the Congressional act intended to protect these animals, which serves to underscore how we have chosen to ignore its ongoing transgression. The effect of this piece is intensified by the sheer beauty of the mosaic work. The pictorial sections are reminiscent of Van Gogh’s expressive landscapes. The cobalt blue of the sky is repeated in the decorative work above, which is offset by a stylized glowing sunburst. The words themselves are integrated into the design, which only serves to point out the dissonance between the ideal and the actual treatment of the horses. Robbins uses her art and her capacity to create beauty to suggest ways that we can find balance in our lives. Currently she is working on a piece that is about recyling gray water. This functional, sustainable activity is embellished with represented organic forms such as leaves and turtle shells — just the sort of human artifact you’d expect if we hadn’t gotten thrown out of the Garden of Eden.